Limoges is the capital of the Haute-Vienne department and the administrative capital of the Limousin region in west-central France. Limoges is served by the train station Gare des B�n�dictins which connects Limoges to the other french cities. For more information about the trains, timetables and tickets, please refer to Limoges B�n�dictins website and French National Railways website. Limoges is served by the A20 highway from Toulouse (249km) or Paris (347km) and by the A89 highway from Bordeaux (183km), Clermont-Ferrand (142km) or Lyon (278km). The conference will take place in the XLIM building of the Faculty of Sciences and Techniques on the campus of La Borie. 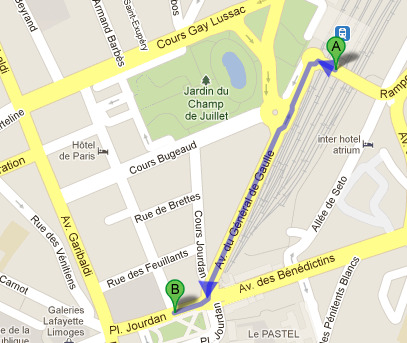 The faculty is served by the bus line no 8, direction Mal Joffre, stop Facult� des Sciences. Leave the train station from the main entrance and go to the STCL buses stop Gare des B�n�dictins (which is located on the right of the train station). Take the bus line no 6 in the direction of Mal Juin then leave it at the stop Place W. Churchill where you can join the bus no 8. Leave the train station from the main entrance and go straight passing by Av. 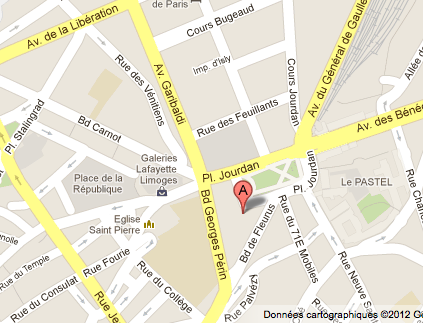 du G�n�ral de Gaulle (parallel to the railway lines) in the direction of Place Jourdan where you can join the bus no 8. 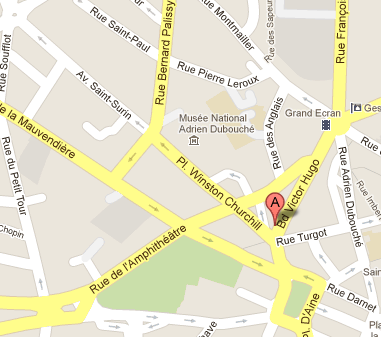 Location: The H�tel des Beaux Arts is located in the center of Limoges near to the buses stop Place W. Churchill. From this hotel to the conference location, the bus line no 8 takes 6 minutes. Location: The H�tel Orl�ans Lion d'Or is located next to the buses stop Place Jourdan and near to the train station Gare des B�n�dictins. From this hotel to the conference location, the bus line no 8 takes less than 15 minutes. 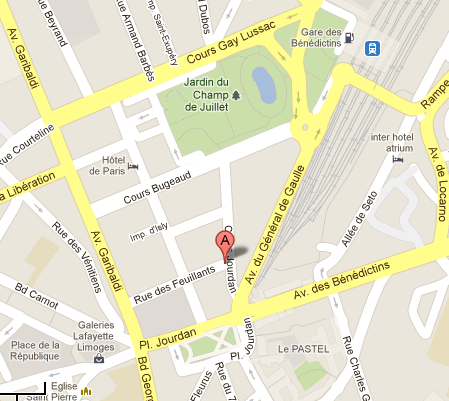 Location: The H�tel de la Paix is located behind the buses stop Place Jourdan. From this hotel to the conference location, the bus line no 8 takes less than 15 minutes.